Jersey coach Ben Harvey said he would consider whether a change to his side's game plan is necessary as he seeks to climb the table. The islanders lost 28-18 to bottom side Ealing, leaving them just six points clear of their fellow strugglers. "The first thing is to look at what we're doing from a coaching staff point of view," he told BBC Radio Jersey. "We need to continue to evolve and make sure that we're not trying to play a game that's alien to the players." Harvey added: "Maybe we're a bit tired, and we might have to look at what we're doing in terms of coaching and rest them as best we can." 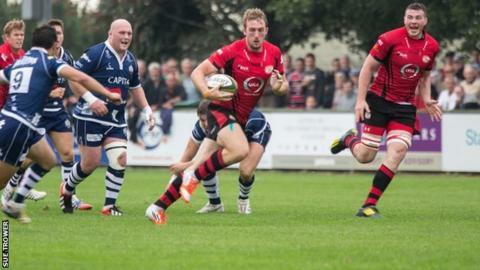 Jersey have won three league games this season, including a morale-boosting 27-25 victory over Cornish Pirates, but the defeat by Ealing - who had lost all of their previous matches - was a real step backwards for Harvey's side. "We're bitterly disappointed and I know how hard the players have worked," he said. "We gifted them a couple of opportunities and they took them very well but we can't lie down like that at home. "We started very well and put them under a lot of pressure and finished off some good tries. We know we're a good side but we let ourselves slip and gifted them too many opportunities." Harvey said the team's predicament was not a major surprise, given the journey the club was on. "I think we knew at the start of the season where we are. We were never going to finish in the top four," he said. "We've got a small squad and we're an evolving club - seven years ago we were in London One so we know we're evolving with a good group of players we're trying to gel together. "We were always going to be there or thereabouts in the lower half of the league. It's a tough fight but I still think the boys have got it in them to put a string of games together and climb the league. "It's a real challenge for us as coaches and the players. It's a pleasure to play in this league but it's tough work as well."